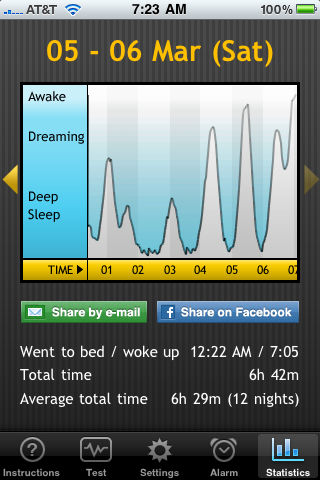 A couple weeks ago I heard about this app called Sleep Cycle. Sleep Cycle is a bio-alarm clock that analyzes your sleep patterns and tries to wake you when you are in the lightest point in your sleep cycle. The app only costs .99$. It was actually the first app I have ever purchased. I purchased Sleep Cycle for two reasons. First, I definitely believe in the power of waking up at the right time. Two, I thought this was a pretty innovative app and was worth a try for a buck. If you know anything about sleep, than you know we sleep in cycles. We move in and out of a dream states and a deep sleeps. An average cycles is about 90 minutes long. The theory goes that if you wake up during your deep sleep, you do not feel as rested. If you wake up when you are in the lightest point of your sleep cycle, you will be able to wake up and get out of bed much easier. I find this to be somewhat true, depending on how much sleep I actually get. Usually I sleep about 6-7 hours each night… I usually go to bed late and get up early. If you look at Thursday, you will see some weird spikes around 2:30AM and 5:00AM. Those were when Gus woke me up to drink some water and then woke me up to go outside (because he drank too much water, I assume). As much as I love this app, I think there are two major flaws. The app is a basic alarm clock, which is great. The way it works is, if you need to be up by 6:30, then you set the Sleep Cycle alarm to wake you up by 6:30. It monitors your sleep cycle and when it feels you are at the most “awake” point in your cycle, it will wake you up. However, if you are in a deep sleep it will wait until 6:30 to wake you up. This is fine, the problem is that you only have a 30 minute window. So it will wake you up anywhere between 6:00 and 6:30. The problem is that the average sleep cycle is 90 minutes. There have been times when my cycle dropped to deep sleep right before the 6:00 mark and it woke me up at 6:30 while I was still deep asleep.I think it would make more sense to make the “alarm” window 45 minutes or 90 minutes… or customizable. Ability to customize the alarm sound from the iPhone’s music collection. Enable the recording device to record whenever it detected noise. So when I am in my dream sleep, I can click to see what I may have said through the night. It currently allows you to share your stats by email and Facebook, should add an option for Twitter. Well, that is about it, overall I really like this app and have already incorporated it into my daily routine. I do not think it will help me get more sleep, but hopefully it will continue to help me wake up easier.